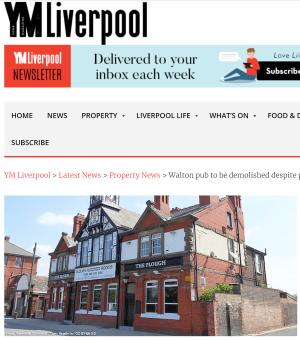 A well-known former pub in Walton will be demolished to make way for a new 40-bedroom hotel, as reported by YMLiverpool. Liverpool City Council’s planning committee approved plans despite more than 1,000 people signing an online petition to save The Plough on Rice Lane. Following a site visit by committee members today (20 November), outline proposals from the applicant Mr Redmond were given the go-ahead. This was after the council received 106 objections to the plans and an online petition to stop the building’s demolition amassed 1,402 signatures. Those in opposition to the proposals argued that the loss of the ‘historic landmark building’ would ‘ruin the heritage’ of the area and maintained the building should be listed and saved. In response to these concerns, Mr Redmond claimed that the building is in a poor state of repair and would require a ‘substantial amount of investment to retain and convert into a hotel’ – something he described as ‘not financially practical’.